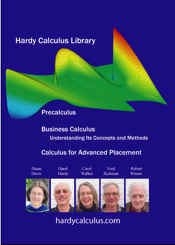 The three Hardy Calculus Library books are complete electronic textbooks featuring live calculations and animated, interactive graphics. They use the included Scientific Notebook® program to display text, mathematics, and graphics on your screen and to provide an interactive environment including examples with user-defined functions, animations, and algorithmically generated self-tests. This environment encourages a focus on mathematical problem solving, experimentation, verification, and communication of results. Scientific Notebook® is an easy-to-use word processor and a powerful but easy-to-use computer algebra system. You do not have to master complex syntax to be able to evaluate, simplify, solve, or plot mathematical expressions. This is a completely integrated environment where you can read and write mathematics and text, compute symbolically or numerically, differentiate, integrate, solve algebraic and differential equations, and create beautiful 2D and 3D plots. Built-in linking capabilities also make this an ideal browser for electronics textbooks, such as Calculus: Understanding Its concepts and Methods and the three books in the Hardy Calculus Library. For animations, user-defined functions, and algorithmically-generated self tests and examples, you need a license for Scientific Notebook® 5.5 or Scientific WorkPlace® 5.5. The Hardy Calculus Library can be purchased with a 30-day, 6 month, one year, or a permanent license for Scientific Notebook®. If you purchase a time-limited license, you will have full functionality when you install Scientific Notebook® from the CD. After the license expires, you can still read the books, and links and popup notes are active. However, interactive features will no longer be available. Purchasing a time-limited license does not prevent you from purchasing a permanent license at a later time. Note: For Scientific Notebook®, floating (Network) licenses and quantity discounts for purchases of 5 or more licenses are available from MacKichan Software, Inc.